Facebook has changed the way students, faculty members, and administrators communicate outside the classroom. Now, with the introduction of the London School of Business and Finance’s Global MBA Facebook app, Facebook is becoming the classroom. The Global MBA app—introduced in October—lets users sample typical business-school courses like corporate finance and organizational behavior through the social-networking site. The free course material includes interactive message boards, a note-taking tool, and video lectures and discussions with insiders from industry giants like Accenture Management Consulting and Deloitte. This may be a good way to market a school, notes an observer from a business-school accrediting organization, but it may not be the best way to deliver courses. Unlike most online business courses, the Global MBA program will not require students to pay an enrollment fee up front. Instead, students can access basic course material free of charge and pay the school only when they are ready to prepare for their exams. School administrators hope that letting students “test drive” the online courses before actually shelling out the tuition money will boost graduation rates. According to their website they expect, conservatively, to have half a million users in the first year. The courses at this School, which has only been around for a few years, are validated by a number of UK universities, including the University of Wales (which has recently had some issues with validated provision in Malaysia). But this really looks like a fantastic promotional achievement designed to boost profile rather than a major educational innovation. Bit surprising that it got quite so much coverage in the Chronicle therefore. GetEducated.com, an online-learning consumer group, managed to purchase an online M.B.A. for its mascot, a dog named Chester Ludlow. 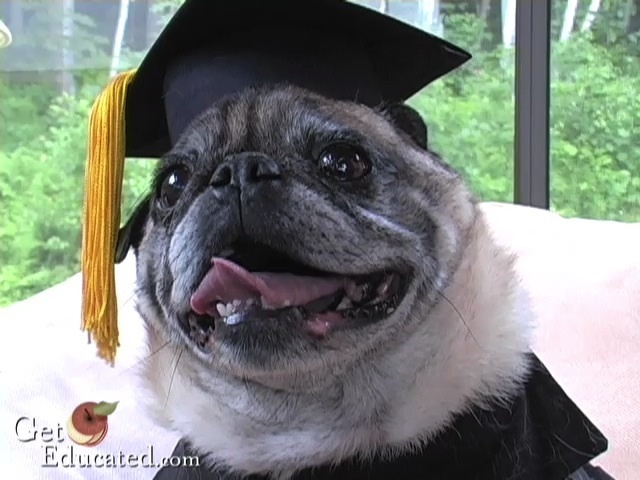 The Vermont pug earned his tassles by pawing over $499 to Rochville University, which offers “distance learning degrees based on life and career experience,” according to a news release from GetEducated. He got back a package from a post-office box in Dubai that contained a diploma and transcripts, plus a certificate of distinction in finance and another purporting to show membership in the student council. Latest league table from the FT is now available.